Double standing cup; silver-gilt; embossed and chased; lip of one cup fitting into that of the other; both identical in design; vertical lip with etched border of interlacing calligraphic scrolls; below, projecting band with oval bosses filled with etched designs and three chased medallions with female masks; elaborate baluster stem with rich chasing, including masks, terminal figures, etc; inscribed; medallion under base of each with subject of Lot and his daughters in relief; inscribed. (i) Assay mark for Augsburg, 1585-16 (R3 125); or Seling 8 (1565-70). (ii) The initials KE with a circular stamp: the punch-mark of Kornelius Erb (R3 423; Seling 1009). (iii) The initials GA (R3 7876): an Austrian duty stamp for old silver plate introduced in 1806-7. (iv) The initials FR conjoined (R3 7884): an Austrian duty stamp for old silver plate introduced in 1809-10. Commentary: Kornelius Erb, the goldsmith from Genoa who settled in Augsburg and in 1586 married Magdalena Grundler (the daughter of an Augsburg master goldsmith, Marx Grundler), died in 1618. However, it is not known when he came to Augsburg nor how quickly he established his reputation as one of the most talented craftsmen that this great centre could boast. Certainly, Kornelius Erb's beautiful silver-gilt ewer and basin with the theme of Orpheus charming the beasts with his music provides eloquent testimony of his skills today, for it formed part of the princely collection created by Wolf Dietrich von Raitenau, Archbishop of Salzburg (1587-1612) and is now preserved in the Palazzo Pitti, Florence. Indeed, Kornelius Erb's exceptional qualities were evidently admired by this patron because in 1594 six of his emblematical tazze were acquired by the Archbishop to join the forty-eight which he had recently ordered from Paul Hübner; today these fifty-four tazze can be seen in the Palazzo Pitti (for a further discussion of these tazze, see cat. nos 24-35; Rossacher, ‘Der Schatz des Erzstiftes Salzburg’, Salzburg, 1966, p. 142, nos 56-61, where the six tazze are dated “1580-85”; also K. Piacenti, ‘Museo degli Argenti a Firenze’, Milan, 1968, pp. 162 ff. ; and I. Weber, Bildvorlagen für silberreliefs an Arbeiten von Paul Hübner und Kornelius Erb, heute im Palazzo Pitti und im Britischen Museum, ‘Mitteilungen des Kunsthischen Institutes in Florenz’, vol. 14, pt. III, June 1970, Florence, pp. 352 ff., figs 28-54, where they are related to graphic works, mainly preserved in the Albertina, Vienna; also Seling 1980, pp. 252-3, figs 182-4, where the six tazze are dated “um 1590-94”). The double standing-cup by Kornelius Erb is probably an early work in this master's oeuvre and, although extremely elaborately enriched with ornamental detail, reveals little originality in design or decoration. It faithfully repeats - with only minor changes - the double standing-cup by the Augsburg goldsmith Theophil Glaubich which has been preserved in the Moscow Kremlin (inv. no. 1037/38) and which, when assembled, measures H. 46.5 cm (see C. Hernmarck, ‘The Art of the European Silversmith, 1430-1830’, 2 vols., Sotheby Parke Bernet Publications, German edn, Munich, 1978, p. 95, fig. 90, where it is dated “c. 1560” and misleadingly stated to be in the Hermitage, Leningrad; also Seling 1980, p. 247, fig. 129, where it is dated “um 1565-1570”). Certainly it cannot be dated any later, because Theophil Glaubich was dead by May 1572 and it was in the 1560s that he was receiving his grandest commissions from the Archduke Ferdinand of Tyrol, whose palace in Innsbruck was then being enriched, from the Emperor Maximilian II and from the ducal Court of the Wittelsbachs in Munich. When compared to the Kremlin double standing-cup by Glaubich it is clear that the changes introduced by Kornelius Erb on the Waddesdon cup are small but significant. Firstly, and most importantly, he has completely changed the profile of the foot so that it does not echo the 'winding spool' element immediately below the bowl. Secondly, he has not left the concave 'winding spool' element plain but, instead, he has given this difficult curving surface a most elaborate form of etched mauresque ornament while at the same time giving a more three-dimensional quality to the 'cover' of this element - particularly significant when the inverted half has been fitted to form the double standing-cup. Thirdly, Erb has subtly increased the interest by altering the rhythm of the twelve divisions on each of the bowls. Whereas on the Kremlin example the three lobes between each oval female mask are identical in size and all have etched mauresque decoration (albeit not of identical designs), Erb has increased the width (and importance) of the female masks by narrowing the middle lobe of each set of three; by leaving that middle lobe plain, he has given it an eye-catching distinction -thereby adding interest to the two differing mauresque-patterned lobes on either side. Furthermore, he has introduced the strap-like motif that traverses the narrow middle lobe but seems to disappear behind the two adjacent lobes before reappearing on either side of the female mask reliefs. Consequently, Erb has given a three-dimensional quality to the triple sets of lobes, and at the same time introduced a visual trick that helps to unify all twelve lobes on each of the bowls. Finally, Erb's female mask is less classical-looking because the swag of beads (or pearls) looped under the chin has joined the more traditional double loop of drapery falling from the temples on either side of the face; similarly, he has introduced a shell motif into the diadem and has accentuated the complexity of the strapwork cartouche that frames the female mask. As a result, Erb has created a more exotic type of female mask and a more obtrusively sculptural relief. The numerous, and apparently minor, changes have been carefully thought out in pursuance of a significant attempt to improve the overall design of the double standing-cup while adhering to the established Augsburg form. In contrast, the solution created by Hans Ment, an Augsburg goldsmith who died in 1604, shows no such qualities; his double standing-cup is partly lost, but the half that has survived and was on the art market in recent years (see Seling 1980, p. 247, fig. 125) demonstrated a slavish repetition of Theophil Glaubich's popular design of the 1560s, as exemplified by the documented Kremlin example. 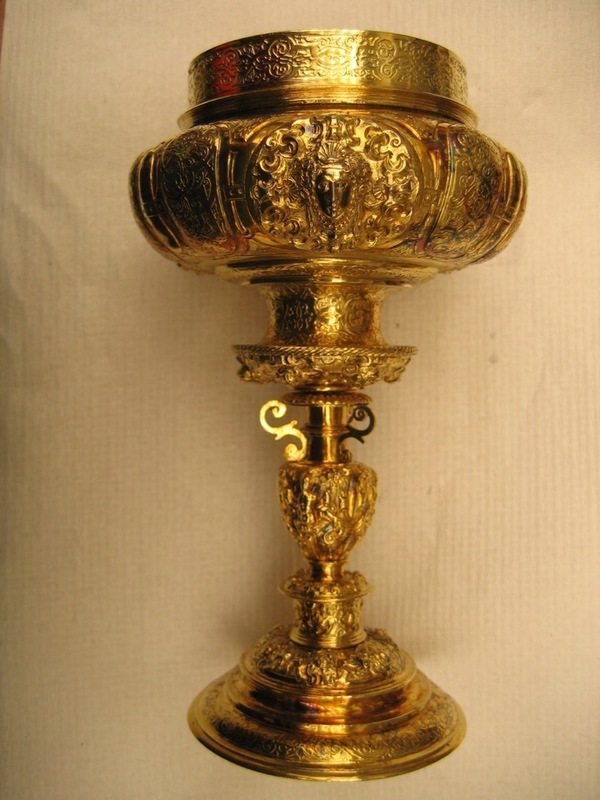 In another version preserved in the Vatican Museum, Rome, Theophil Glaubich has again used many of these elements; it is a standing-cup that has been converted for use as a ciborium - like the closely related example in the Liechtensteinisches Landesmuseum, Vaduz, which was subsequently given in the early eighteenth century to the Pfarrkirche St Nikolaus in Balzers (see ‘Welt im Umbruch: Augsburg zwischen Renaissance und Barock’ II Rathaus, Augsburg, 1980, pp. 316-17, no. 699, with illus. and bibl.). Another historic Augsburg double standing-cup has been recently published as being of very similar design and character to the Kremlin example by Theophil Glaubich; it is now preserved in the Thyssen-Bornemisza Collection, Lugano (see Müller 1986, pp. 140-1, no. 37, where this anonymous piece is surprisingly dated as early as the “mid-1560s at the latest” and where its history is stated to have been traced back through the Erödy family at Galgoc (Hungary) to Count Ladislaus Rakoczy de Felsö Vadacz, who died in 1664). However the stems have been badly altered, both at the top and the lowest sections of each cup, so that the original proportions and design can only be surmised; furthermore, the female masks within their curious flat cartouches on the bowls bear no resemblance to those of either Theophil Glaubich or Kornelius Erb. Whereas faint echoes of the classical Eastern Mediterranean type of mask may still be detected in the masks on the Kremlin and Waddesdon double standing-cups, the reliefs on the Lugano example are not masks (as stated), for they have necks. These female heads, full-face, have the hair arranged in the late sixteenth-century fashion with two 'horns' above the forehead; they appear to wear no jewellery or drapery. Most unexpectedly, Dr Müller states that these six reliefs are 'embossed' - not cast and applied. This departure from the normal practice is not commented upon by Dr Müller, although her description of another double standing-cup in the following entry (WB.146: a second Augsburg double standing-cup of different form) does state that on that piece each of the six cartouches with a female mask is cast and “soldered on to the lobe” (Müller 1986, p. 142, no. 38). In fact, it is not usual to find that the cast reliefs are soldered on to the surface of the lobes; they are normally placed over the holes specifically cut in the lobes to receive them, and then they are soldered into position in the manner of insets. Therefore, if Dr Müller is correct in describing the six reliefs of the female heads and necks in cartouches as 'embossed', it is a further major reason for disputing her final conclusion (p. 140) that “the closest parallel as regards structure and ornamentation is, however, the double cup in the British Museum, London, attributed to Cornelius Erb.” Indeed, it should be stressed that the Lugano double standing-cup exhibits none of the improved features introduced by Kornelius Erb on the Waddesdon piece: the 'winding spool' element remains undecorated, the sets of three lobes on each bowl (between the reliefs) remain of equal size, there is no engraved straplike motif to unite the lobes, and the prominent three-dimensional sculptural effects on the reliefs are not seriously attempted. The Lugano example, with its unidentified maker's mark, remains a feeble (and badly altered) version of the Kremlin double standing-cup by Theophil Glaubich. In the Waddesdon example Kornelius Erb - probably in compliance with his patron's instructions - has adhered to the Augsburg conventional form, but within those constricting limits he has displayed his talents for creating an excitingly rich profusion of surface ornament and, at the same time, a strong, dominant form of excellent proportions and rhythmic harmonies. Finally, there is the question of the age and origin of the two medallions, each depicting in relief the identical scene of Lot and his two daughters (Genesis 19, vv. 30-5), and each set in a circular frame decorated with an etched band of mauresque ornament. There is no corresponding plaquette of this subject listed in Dr Ingrid Weber's comprehensive survey, though some similarities can be detected in two circular plaquettes attributed to Jakob Koch II, who was active in Nuremberg in the late sixteenth and early seventeenth centuries (see I. Weber, ‘Deutsche, Niederländische und Französische Renaissanceplaketten 1500-1650’, Munich, 1975, pp. 319-20, nos 742-3, pl. 205). Of the two, the larger, which is signed I. K. and bears the arms of Nuremberg, is dated by Dr Weber “vor 1608” and is said to be based on the Virgil Solis woodcut, which was used to illustrate the ‘Biblia Sacra’ of 1563. In it the figure group of Lot and the daughter embracing her father is closely related, though not identical; on the other hand, the second daughter is shown standing on the right and pouring wine from the jug into the goblet held by her sister. However, the Waddesdon pair of medallions are, perhaps, closer in general character to the smaller of the two plaquettes attributed to Jakob Koch II, although the figure of Lot is placed in the centre, between his two daughters. Significantly, Dr Weber only cites one example of this smaller version (DIAM. 5.2 cm) and that is a silver-gilt example in the Bayerisches Nationalmuseum, Munich, which Dr Weber classifies as a free variant of the composition of the larger plaquette signed I. K. However, the silver-gilt example lacks a provenance, having been sold in an auction sale at Frankfurt in 1928. If the latter were to be firmly accepted as genuine - and Dr Weber only describes it as “Anfang 17. Jahrhundert (? )” - then there would be a stronger possibility that these two Waddesdon roundels might also be authentic. However, the evidence is not conclusive and there are several reasons for doubting their age, not least the irrelevance of the subject - and the fact that it is also duplicated. Indeed the double-cup, as a form of secular plate, is often stated to have been especially popular in the late medieval and Renaissance era as a wedding gift because the two parts unite to form one (see H.-M. von Erffa and D. F. Rittmeyer, Doppelbecher, ‘Realexikon zur Deutschen Kunstgeschichte’, IV, Stuttgart, 1958, pp. 165 ff. ; Klaus Pechstein, ‘Goldschmiedewerke der Renaissance: Kataloge des Kunstgewerbemuseums Berlin, Band V’, Berlin, 1971, no. 14). It would be difficult to imagine a more inappropriate choice of biblical scene than the story of Lot and his daughters for the decoration of a betrothal or marriage present. However, there were many other kinds of occasion on which the double-cup was the chosen form; for example, the 'Englischer Doppelbecher' belonging to the Gesellschaft der Schildner zum Schneggen (the Society of Nobles at the Sign of the Snail) in Zurich was in 1629 presented by the Earl of Carlisle, Charles I’s ambassador to the Swiss Confederation. He had come from Venice to Zurich to discuss with the Protestant cantons of Switzerland the question of aiding their fellow Protestants of France and the Netherlands. After entertaining them, and the city dignitaries, at the Schneggen the Earl of Carlisle ordered from a Zurich goldsmith (Hans Heinrich Holzhalb) the piece of plate that he thought would best please this host society - it was a typical German-style double standing-cup that is 84 cm high when placed one above the other (see C. Keller-Escher, ‘Der Silberschatz der Gesellschaft der Schildner zum Schneggen in Zurich’, Zurich, 1913). The form was clearly extremely popular for display purposes. Indeed, the Schneggen had earlier been given an Augsburg double standing-cup in 1584 by the city of Geneva - also with similar female masks. It is interesting that the armorial shields of the two cities, Geneva and Zurich, were almost certainly added at the time of the gift - presumably by a goldsmith in Geneva. Less historic and significant additions may often have been perpetrated by nineteenth-century owners who found the underside of the upturned foot of a double-cup rather unsightly. Hugh Tait, 'Catalogue of the Waddesdon Bequest in the British Museum, II : The Silver Plate', British Museum, London, 1988, pl.VI, nos. 22-23, figs. 144-150.